"We don't collect a lot of your data and understand every detail about your life. That's just not the business that we are in," says Apple CEO Tim Cook, shown here at the NPR offices in Washington, D.C., on Thursday. Apple has long touted the power and design of its devices, but recently the world's most valuable company has been emphasizing another feature: privacy. That's no small matter when many users store important private data on those devices: account numbers, personal messages, photos. Apple CEO Tim Cook talks to NPR's Robert Siegel about how the company protects its customers' data, and how it uses — or doesn't use — that information. The government comes to us from time to time, and if they ask in a way that is correct, and has been through the courts as is required, then to the degree that we have information, we give that information. However, we design our products in such a way that privacy is designed into the product. And security is designed in. And so if you think about it ... some of our most personal data is on the phone: our financial data, our health information, our conversations with our friends and family and co-workers. And so instead of us taking that data into Apple, we've kept data on the phone and it's encrypted by you. You control it. On national security, encryption and calls for a "back door"
I don't think you will hear the [National Security Agency] asking for a back door. ... There have been different conversations with the FBI, I think, over time. ... But my own view is everyone's coming around to some core tenets. And those core tenets are that encryption is a must in today's world. And I think everybody's coming around also to recognizing that any back door means a back door for bad guys as well as good guys. And so a back door is a nonstarter. It means we are all not safe. ... I don't support a back door for any government, ever. Our view on this comes from a values point of view, not from a commercial interest point of view. Our values are that we do think that people have a right to privacy. And that our customers are not our products. We don't collect a lot of your data and understand every detail about your life. That's just not the business that we are in. If you're in our News app, and you're reading something, we don't think that in the News app that we should know what you did with us on the Music app — not to trade information from app to app to app to app. 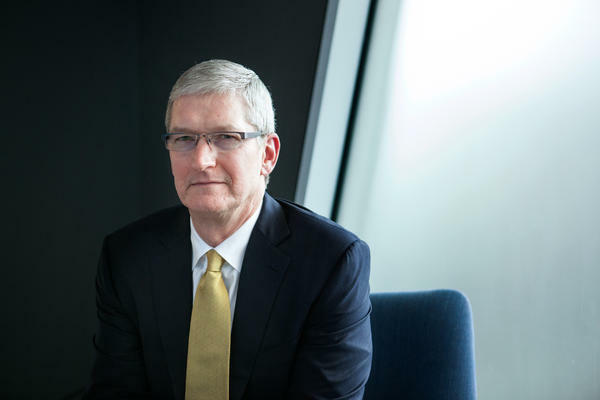 Tim Cook is in Washington today with something to say about privacy. That is no small matter when you're the CEO of Apple, the world's most value company, maker of devices where many of us store our secrets, account numbers, personal messages, photos. Tim Cook, welcome to the program. TIM COOK: Thank you very much, Robert. It's great to be here. SIEGEL: I'm going to ask you this question about privacy. It's been reported that Apple turned down a government request for real-time monitoring of texts that the government said were about guns and drugs. Is that an absolute position of Apple? Or if there's some text message that supposedly concerns hijacked airplanes and skyscrapers and dirty bombs, would you say, the government - you can have that? COOK: You know, I can't talk about a specific case, but the government comes to us from time to time. And if they ask in a way that is correct and has been through the courts, as is required, then, to the degree that we have information, we give that information. However, we design our products in such a way that privacy is designed into the product, and security is designed in. And so of you think about it, as you pointed out earlier, some of our most personal data is on the phone - our financial data, our health information, our conversations with our friends and family and coworkers. And so instead of us taking that data into Apple, we've kept data on the phone, and it's encrypted by you. You control it. SIEGEL: But does that mean that if a clever terrorist encrypts his texts, it really doesn't matter whether the government has access to that or not? COOK: National security always matters, obviously. But the reality is that if you have an open door in your software for the good guys, the bad guys get in there too. Think about what happened here in this city with as many - literally tens of millions of employees of the government getting their data stolen. And so we think that our customers want us to help them keep their data safe. SIEGEL: The intelligence community has asked for a backdoor. I mean, they want access into the communications that are going through Apple's devices, no? COOK: I don't think you will hear the NSA asking for a backdoor. COOK: There've been different conversations with the FBI, I think, over time, and I've read it in the newspaper myself. But my own view is, everyone's coming around to - there's some core tenants, and those core tenets are that encryption is a must in today's world. And I think everybody's coming around also to recognizing that any backdoor means a backdoor for bad guys as well as good guys. And so a backdoor is a nonstarter. COOK: It means we're all not safe. SIEGEL: For the U.S. government and other governments as well. COOK: For any government. I don't support a backdoor for any government, ever. SIEGEL: Apple has a new website, apple.com/privacy. It's devoted to your company's privacy policies and practices. One nugget that I loved was that 94 percent of law enforcement requests that Apple gets are actually concerning stolen Apple devices. You know, they want help to try to locate a missing device. All of this effort you're putting into this, do you believe that your customers are demanding this from you, this kind of information and this guarantee of privacy? COOK: We do think that people want us to help them keep their lives private. You know, we see that privacy is a fundamental human right that people have, and we're going to do everything that we can to help maintain that trust. SIEGEL: So some critics hear you talk about privacy and sense a not-so-subtle dig at Google. And did they say Apple's in the hardware business. If there were no apps that tracked our searches or our whereabouts or our location, there might not be enough useful stuff to fill up our iPhones with. COOK: Robert, our view on this comes from a values point of view, not from a commercial interest point of view. Our values are that we do think that people do have a right to privacy and that our customers are not our products. We don't collect a lot of your data and understand every detail about your life, and that's just not the business that we're in. SIEGEL: But people buy the apps from the App Store, and they buy music from iTunes - or the iTunes store. A customer's purchasing history is available. Do you make absolutely no use of that in what people see on their devices? COOK: Yeah. Let me be clear. If you buy something from the App Store - and we do know what you bought from the App Store, obviously. We think customers are fine with that. Many customers want us to recommend an app. But what they don't want to do, is, they don't want your email to be read and then to pick up on key words in your email and then to use that information to then market you things on a different application that you're using. SIEGEL: ...That you would consider to be fair game? COOK: Well, let me very clear. So let's say you buy a song. We think you want us to know that you bought the song. You bought it from us. And we think you want us to kind of look at that and, assuming you've opted into Genius, we'll recommend you another song that you might like. We think that's perfectly fine. We think it's perfectly fine for any retailer to do that. But if you're in our News app and you're reading something, we don't think that, in the News app, that we should know what you did with us on the Music app - not to trade information from app to app to app to app. SIEGEL: I have a corporate question for you. Apple has a lot of money overseas - according to one report, more than $180 billion, I gather. When political candidates proposed their tax reform plans, one measure of success they claim is this will get people to bring money back to the U.S. What kind of corporate tax rate would lead you to think the coast is clear; let's move $180 billion back to the U.S.? COOK: I think one key thing to understand here is that the reason we have a lot of money overseas is because two-thirds of our sales are overseas, and therefore we earn a lot of money overseas. And the tax law that we have today is very archaic. It doesn't allow you to bring back money unless you pay tax both internationally and then pay the full tax domestically as well. And so the truth is almost nobody's bringing back their money. It's not an Apple-unique thing. And so what needs to happen - we need a comprehensive tax reform. There's no doubt that for a company operating in the United States, it's worth a tax to be able to bring money back, to have free flow of capital. It's also great for the United States because you can't invest that money unless it's in the U.S.
COOK: Well, here's what we're having to do today. Yeah. We've had to borrow money. And so despite having money, we've had to borrow. Everybody can't do that, and so what we're doing is telling people to go put their money elsewhere. That's not reasonable. That's terrible for the United States. SIEGEL: Is there going to be an Apple car? COOK: (Laughter). Do you have another question? SIEGEL: (Laughter). Well, you know, cars are all the rage. There's a Google car. There's Tesla car. COOK: I - you know, I've been reading about a lot of stuff. But we're focused very much on the products that we've just announced. We've got iPhone 6S, iPhone 6S Plus. We're thrilled about that. They've got incredible features like live photos. COOK: And you know, we've got Apple TV coming out next month. COOK: We've got iPad Pro - this unbelievably gorgeous screen. SIEGEL: Why so resistant to just, you know - we're thinking about this; we're working on it - no? You don't want to talk about the Apple car. COOK: No. Do you have another question? SIEGEL: Tim Cook, CEO of Apple, thanks for talking with us today. COOK: Thanks Robert, great being here. Transcript provided by NPR, Copyright NPR.